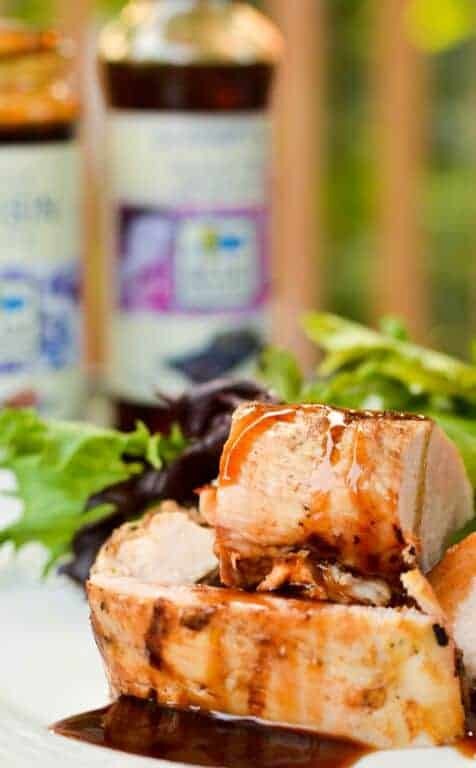 Today I’m sharing some great BBQ hacks for amazing grilled chicken breast! You know what I love about chicken breast? It is a lean cut of meat, affordable and filling. 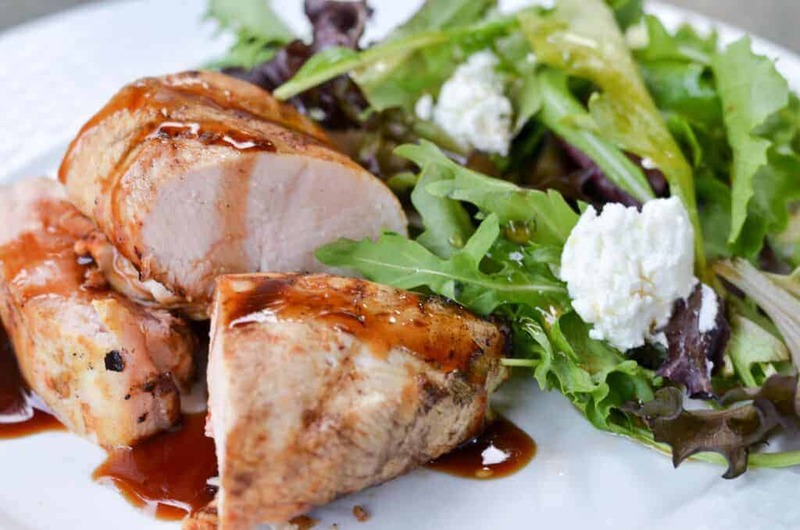 Eating a delicious chicken breast recipe for lunch or dinner will fill you for a long time and you won’t have cravings after. And you know what I don’t like about chicken breasts? They can be bland and dry if you don’t season properly. They can even be drier if you grill on the BBQ and don’t grease your BBQ before using it. That would be a waste of food and money when kids and significant other eat half of the chicken breast because they find it uninteresting. 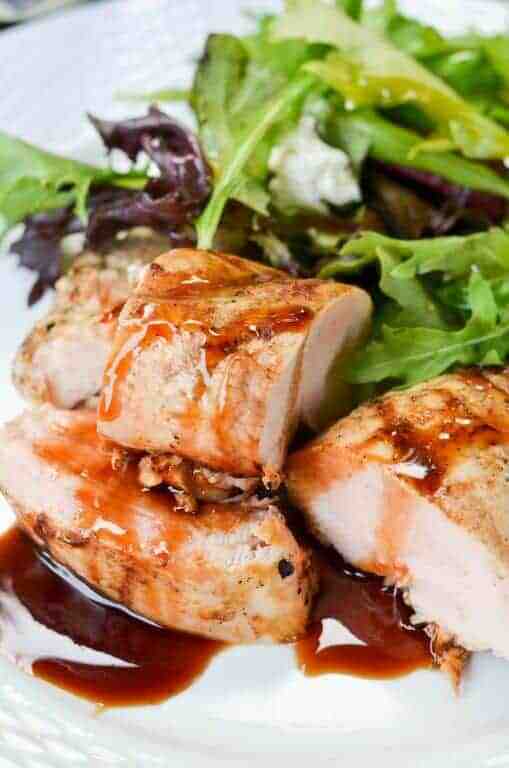 But I found few BBQ hacks for grilled chicken breasts that you will lick your fingers after. Once I shared these with you, I will be sharing a delicious grilled recipe with one of my favourite sauces: Blue Dragon Hoisin Sauce. You know how much I love this sauce. You can check one of my previous recipes: BBQ chicken wings or my grilled avocado recipe with shrimps. The secret with chicken and chicken breasts in general is the marinade. I usually marinate them for 24 to 48 hours. This will make the meat tender and juicy. My marinade are usually simple: I add some mustard, oil, some Hoisin Sauce. I cover and store in the fridge. I make sure I oil my BBQ grill with sesame oil. I learned this hack from Blue Dragon Canada Facebook page. Isn’t it amazing: quick, simple and you will add a nice flavor to your dishes. When grilling, I cover my BBQ for the first 5 minutes and then uncover it. I don’t want my meat to burn. During grilling, I brush my meat with Hoisin Sauce or any other marinade I am using. It will keep the meat moist and tender. In a small bowl, combine the olive oil, mustard and 3 TBSP of Hoisin sauce. I am sharing approximate amount for the marinade based on my family’s tastes. Depending on your taste, you can add more Hoisin and less mustard. Put the chicken breasts in a large bowl. Add the above marinade. Make sure to mix well. Cover with plastic wrap and store in the fridge for 24 hours at least. Serve with your favourite salad recipe topped with some goat cheese. It is as easy as that. I know the marinade part can be annoying if we don’t plan it in advance but it is totally worth it. The days I forget to marinate the chicken breasts, the kids frown and don’t eat the dish. But the days I don’t, like today’s recipe, they keep asking for more, even if they ate the whole dish. Looking for more great BBQ ideas? Head over to the Blue Dragon Canada website! Follow them on Twitter to keep up with all their exciting news. Check out their Tumblr for tons of amazing inspiration and beautiful pictures! Do you have any favorite BBQ hacks? Tell me in the comments! awesome …looks and sounds delish thanks for sharing the recipes , a must try ! Thanks for sharing this delicious (looking) recipe! I’m always in search of new recipes for grilled chicken, so I pinned this one for later! Thanks for sharing with us at Dream. Create. Inspire. Link. This looks delicious and no doubt tastes just as good as it looks. I’ve used Hoisin sauce quite a lot and love it. Yup, you are dead on with the time needed to marinade. It’s key to really getting the flavor in there. I do a lot of rubs now simply because I never plan well enough to marinade properly. I have heard so much about Hoisin sauce but have never cooked with it. I need to give this a try. This recipe looks so delicious! Hi, I’m Anita visiting from Artsy Fartsy Link Party. This looks like a great recipe for chicken. We cook and eat a lot of chicken because it is one of the few things I’m not sensitive to. We’ll have to try this! I’m going to need to try that sauce. I like using easy BBQ hacks like flavorful sauces to cook! Those cake pops look delicious! Visiting from the Two Cup Tuesday linkup. Come join the Share It Wednesday Link Party going on now at http://www.urbangirlbakes.com! Yummy! This recipe looks and sounds super delicious! I must try this the next time I fire up my grill. I have to try this recipe. It looks like it tastes amazing. I love barbecue everything! This looks amazing and so tasty. Thanks so much for sharing this delightful dish. Well that looks amazing! I may have to deviate from my meal plan to try this! This looks absolutely delicious. I love the tip you shared. Oh that looks spectacular. Love bbq. Omg now this just looks absolutely delicious!!! I just love grilling chicken in the summer! Too yummy! This sounds amazing. I have never used Hoisin sauce before. I am looking forward to trying this. I love to BBQ chicken. I find it always dries out on me. I will have to try these tips tomorrow when i grill. Look really good! I am going to have to try marinating my chicken longer. I often find it dries out on the bbq. I saw this on Twitter yesterday and it sounds so good! Great recipe for BBQ season too! With all honestly, we’ve never tried grilling chicken here in the U.S. yet. I’ve tried it a lot of times with my family back home. I need to show this to the hubs. Bet it will delight him. I use this brand all the time in my cooking and absolutely love the flavours they create in my cooking! Thanks so much for the tips! I am so green to bbq’ing that I don’t have a hack at all. I simply use honey bbq sauce and call it a day. LOL! I so love this! Looks very delicious! That chicken looks fantastic! I love a good marinated chicken, and I love Asian foods, so this is a doubly good recipe in my book. I will have to give it a try. I was amazed at the difference in how my chicken tasted once I started using a marinade! BBQ chicken is a favorite recipe. This sounds like a wonderful chicken recipe. We are always looking for new chicken recipes. I’ll have to add this one to our list. This sounds so tasty! My family would really enjoy it! Yum! Looks so good! Thanks for the hack! I will definitely be trying this soon! This is a great recipe hack. It looks really good. I’ve have to pin this for a later date. I really want to try this recipe. Love those tips. I know marinate is the key to most good meals, it’s just a matter of remember to do it! I love your tip about oiling the bbq grill. I’m going to make this chicken dish on the weekend at the cottage. I’m sure it will be a hit with my family. Yumm!! I have not tried using hoisin sauce for my barbecue. But, there’s always first time for everything. This looks really good, I will add this to my Pinterest board. I already have some Hosin saucse so I’m almost there. That sounds so delicious! A good sauce really makes the dish. And chicken is great with tons of different sauces. Summer and BBQ. You really can’t have one without the other. 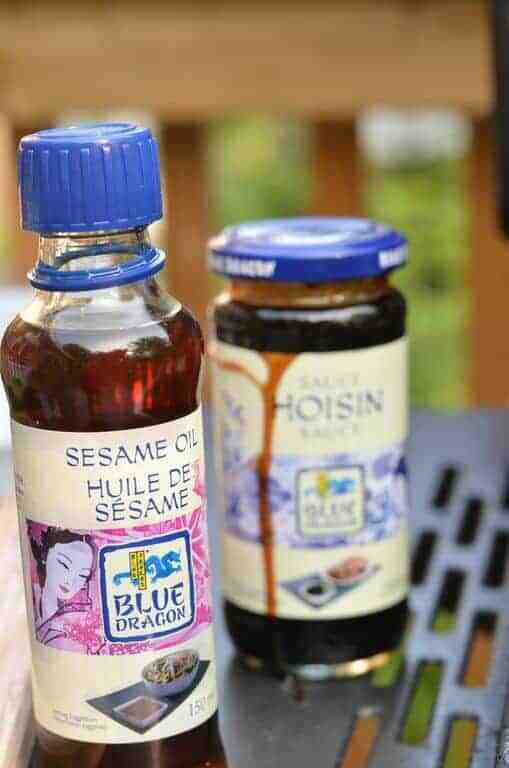 Your Hosin sauce ideas are really exciting.I have not tried the Blue Dragon but my mouth is watering after reading your post and looking at your pictures. YUM! I’m loving your tips…your meat looks fantastic! You are totally right about the importance of marinating…I need to get more organized to take advantage of that cooking technique. That looks like a delicious and juicy piece of meat! Sadly, I don’t usually thing about what I’m having for dinner until 10 minutes before I begin cooking, which makes marinades non existent for me! Question: Do you know if Blue Dragon makes any Gluten Free products?? I have never tried using sesame oil yet but you are encouraging me withthis delicious looking meal. So tasty and it makes me hungry. Thanks for sharing the recipe too! I just discovered the wonderful reason why to add Hoisin Sauce a few years ago. I will have to check out this brand and give it a try. Tis the season for grilling so I know this will be a favorite recipe for many. These are some great tips! My husband can’t get enough of the BBQ and I’m sure he could use some of these tips! I just made a chicken recipe with hoisin sauce and we all really liked it. I’ll have to try this recipe too! I love anything quick and easy in the summer. Thanks for sharing! This looks great. I love grilled chicken breast, it’s my favorite way of eating chicken. I’ll have to try this. Those pictures say it all = YUMMY! We are huge Asian food lovers and I always look for ways to make out take out favourites at home! Thanks for the tips! This looks super yummy!! I am hungry right now and this BBQ chicken isn’t helping…LOL!! Yum! We love to grill, and we love barbecue. We also love Asian food and the flavors. This is the absolute perfect thing for us. It looks tasty good. I am in charge of dinner tonight, I think we can do this! That sounds fantastic! I love this Asian take on barbecue. Yum! Dried out chicken is the worst! Thanks for sharing these tips. I will have to try this the next time we grill. This looks really amazing! I just discovered Housin sauce recently and I love the flavor it adds to food! I can’t wait to try it on my chicken! I have never heard of this sauce and must check it out soon! Your recipe and photos look mouth watering and I could see me reaching through the screen to try some now! The sauce looks like it would have a secret ingredient or two that one could not recreate by themselves at home! That sauce sounds amazing. I love a good bbq sauce when I grill my chicken. Hoisin sauce is very versatile and can be used in a variety of dishes. I like the way you prepared your grilled chicken. It is definitely an easy one to follow. Thanks for sharing! Oh this looks oh so good! 🙂 I want to try it out, super moist too!! I have to try this! That chicken looks amazing! I love BBQ. I have never heard of this sauce before, sounds really good. This looks delicious .Thank you for sharing the recipe . Thanks for sharing this recipe! It looks amazing! Oh my word that looks great! Thanks for sharing, I might just have to try this recipe this week. Your recipe looks so delicious! I also marinate mine for 24 hours before cooking! Awesome post! That looks delicious! mouth watering……I need to get some Hoisin sauce, so many possibilities!